By the power of Greywater! My rough estimate is that at home it takes about three litres of running the hot tap before the water actually gets hot. 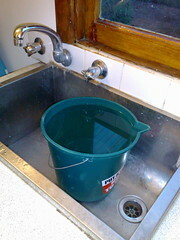 One of my most commonly-used taps is in the laundry sink, which doubles as a sink for the back toilet. Being a laundry sink it’s big enough for a ten litre bucket, so I’ve put one in there. Consequently that bucket is collecting an enormous amount of greywater for the garden — way more than the bucket in the shower collects, in fact. Hopefully it’ll help the back garden grass stay green… and get the (newly moved) lemon tree producing. This is exactly what my grandparents have always done and what may parents have now begun to do. They grew up in a time when Melbourne didn’t yet have water to spare, so they had to watch what they did with it. Then the Thompson Dam was built and people became complacent for a couple of decades. Until the population grew to the point where water storages were insufficient once again. It’s interesting that this time the government’s approach is to use brute electrical force to desalinate sea water, rather than working cleverly with rainwater and adding more wastewater recycling projects such as the existing pumps from the Yarra into Sugarloaf, which were some of the solutions decades ago. We did what my (retired) plumber Dad did back in the 1960’s drought – opened the inspection cap on the waste water pipe and diverted the water through a pipe out onto the garden. This is connected to the bath/shower (not that anyone has baths these days!) and laundry troughs. When we were having renovations done, we installed a solar hot water system, and the plumber added insulation to all the hot water pipes. After that, instant hot water every time. My folks did the same thing during the 1972-73 water restrictions. Time to start it up again. It’s true that a lot of water is wasted when you turn on the hot water faucet. We cannot afford to do this at this stage and need to save every drop of water we can. Fresh water reserve levels have dropped significantly over the last few years. If you go to http://tr.im/vh94, you’ll see how far our water reserve levels have dropped. They have a gauge on this site that looks like the fuel gauge in your car, but with three-color zones: Blue – good, Yellow – not good, and Red – bad. The needle on this gauge is dropping out of the blue zone and heading into the yellow zone which means Mandatory Conservation. Which is why hot water services are normally put close to frequent, short use sites – the kitchen sink being the major culprit – and further from the infrequent, extended use sites (the bathtub and shower). Please don’t tell me you wash your hands with hot water.